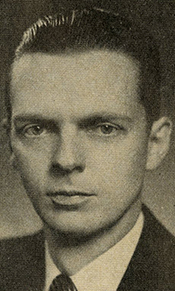 STRATTON, William Grant, a Representative from Illinois; born in Ingleside, Lake County, Ill., February 26, 1914; attended the public schools; graduated from the University of Arizona, Tucson, 1934; elected as a Republican to the Seventy-seventh Congress (January 3, 1941-January 3, 1943); was not a candidate for renomination in 1942; Illinois state treasurer, 1943-1944, and 1950-1952; served as a lieutenant in the United States Navy, 1945-1946; elected as a Republican to the Eightieth Congress (January 3, 1947-January 3, 1949); was not a candidate for renomination in 1948; delegate to the Republican National Conventions of 1952, 1956, 1960, and 1976; elected governor of Illinois in 1952, and reelected to the succeeding term, serving from January 12, 1953, to January 9, 1961; was an unsuccessful candidate for reelection as governor in 1960; unsuccessful candidate for nomination for governor in 1968; died on March 2, 2001, in Chicago, Ill.; interment in Rosehill Cemetery, Chicago, Cook County, Ill.
Kenney, David. A Political Passage: The Career of Stratton of Illinois. Carbondale: Southern Illinois University Press, 1990.